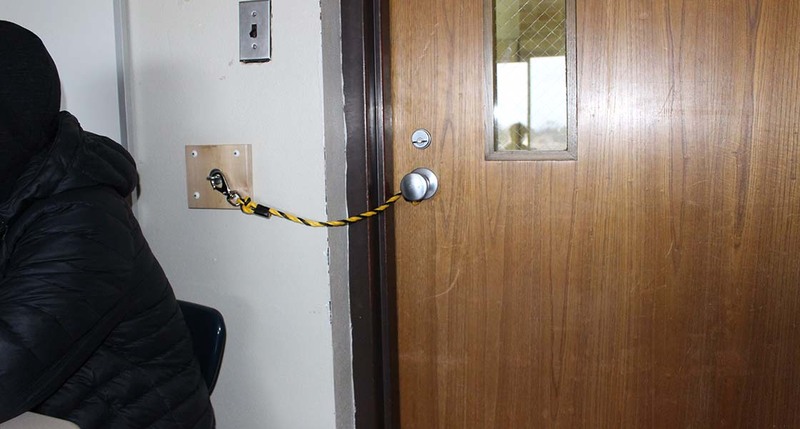 School safety measures to thwart a school shooter range from the low tech, like a rope around a door knob shown here in a Grand Blanc classroom, to six-figure gunshot sensors. But the state doesn’t keep tabs of what school districts are doing, according to the Michigan State Police. How prepared are Michigan schools to thwart a mass shooting? It’s difficult to tell, because of minimal state-level regulation and reporting. No office collects or records what schools across the state are doing to thwart school shooters, according to Nancy Becker Bennett, director of the grants and community service at Michigan State Police, who serves as the state’s point person for school safety. While most schools have an emergency plan for armed intruders and other crises, they haven’t been required by the state to have a plan or to follow certain minimum standards, Bennett said. Schools will for the first time be required to have emergency plans in 2020. And an Office of School Safety, created by the Legislature in December to address issues raised by a 2018 task force on school safety, exists on paper only because neither the Legislature nor the governor’s office has proposed funding it. There have been 16 multi-victim shootings in U.S. public schools since 1996, with an average of 10 students shot and killed per year. Michigan schools have avoided any mass shootings so far, and school districts contacted by Bridge have both hardened their schools security protections with steps such as locking outside doors, and undergone extensive training. Related: Shooter drills. Anxious teachers. Flying staplers. Michigan schools prepare. The state has helped, distributed $56 million in state grants in the past five years to schools for safety improvements. Former Gov. Rick Snyder signed several school safety bills into law in December. The new laws create the School Safety Commission and the Office of School Safety within the Department of State Police, aimed at developing model safety practices and training for Michigan schools, K-12 school districts, charter schools and intermediate school districts. One of the laws passed in 2018 will require schools to come up with emergency plans by January 2020 and regularly review them with police agencies. They’ll also have to discuss school safety with law enforcement before building or renovating schools. School boards will be allowed to meet in closed session to talk about school security plans. The laws also require new training for law enforcement officers and require school districts to report certain crime incidents to the state. The state already requires schools to conduct three lockdown drills each school year – two during class times and one during a time when students are not in classes. Michigan State Police last year awarded $25 million in grants to schools to spend on equipment or technology to improve school security. No office, though, records what school security steps are being taken at different schools. In 2018, a state school safety task force released a 32-page report with recommendations for school emergency plans, including the installation of solid-core, outward-opening doors, anti-intrusion devices and access to a two-way public address system. They are recommendations, not mandates, Bennett said. The state does not track what type of emergency protocols are followed by schools. “We simply encourage whatever (emergency plan) they choose, that they practice it,” Bennett said. Letting local officials make the call on how to handle emergencies in their own buildings makes sense because “they know their buildings,” Bennett said. But J.P. Adams, director of operations for Grand Blanc Community Schools, says local control of emergency operation plans can also lead to disparities in safety. Michigan State Police endorse the ALICE active shooter plan of Alert, Lockdown, Inform, Counter, Evacuate. Grand Blanc was an early adopter of that plan, which includes “countering” a shooter by throwing things at them as a last resort to throw off their aim and allow the possibility of escape. “I know schools that are still doing the same thing they’ve done for 20 years – wait in a corner to die,” Adams said. Bennett said the new Office of School Safety was the Legislature’s attempt to consolidate statewide school security issues. The office is to create model practices and offer training to school districts. Bennett was named director of the office, but it has yet to receive funding. “There is nothing currently in the pipeline for the Office of School Safety,” said Kurt Weis, spokesperson for the Department of Technology, Management and Budget. Weiss said the State Budget Office didn’t include funding for the office in either the Fiscal Year 2020 budget recommendation or in any of the supplemental requests current Gov. Gretchen Whitmer has sent to the Legislature. Trey Hines, chief of staff for Rep. Larry Inman, R-Traverse City, chair of the House Military and Veteran Affairs and State Police subcommittee, also held out the possibility of funding for the school safety office. “We are still in conversation with MSP (Michigan State Police),” he said. As I read this article, it is tantamount to creating the Homeland Defense division and then not funding it initially as it was placed under a different umbrella of control. If this legislature is smart they will allocate funding and with collective input, produce a standard publication that will provide guidance for newly established security coordinator.